For the division of living organisms, see Archaea. The Archean Eon (pronunciation: /ɑːrˈkiːən/, also spelled Archaean) is a geologic eon, 4,000 to 2,500 million years ago (4 to 2.5 billion years), that followed the Hadean Eon and preceded the Proterozoic Eon. During the Archean, the Earth's crust had cooled enough to allow the formation of continents. Archean (or Archaean) comes from the ancient Greek Αρχή (Arkhē), meaning "beginning, origin". It's earliest use is from 1872, when it meant "of the earliest geological age." In earlier literature the Hadean Eon was included as part of the Archean. Instead of being based on stratigraphy, the beginning and end of the Archean Eon are defined chronometrically. The eon's lower boundary or starting point of 4 Gya (4 billion years ago) is officially recognized by the International Commission on Stratigraphy. The Archean is one of the four principal eons of Earth history. When the Archean began, the Earth's heat flow was nearly three times as high as it is today, and it was still twice the current level at the transition from the Archean to the Proterozoic (2,500 million years ago). The extra heat was the result of a mix of remnant heat from planetary accretion, from the formation of the Earth's core, and produced by radioactive elements. Most surviving Archean rocks are metamorphic or igneous. Volcanic activity was considerably higher than today, with numerous lava eruptions, including unusual types such as komatiite. Granitic rocks predominate throughout the crystalline remnants of the surviving Archean crust. Examples include great melt sheets and voluminous plutonic masses of granite, diorite, layered intrusions, anorthosites and monzonites known as sanukitoids. The Earth of the early Archean may have supported a tectonic regime unlike that of the present. Some scientists argue that, because the Earth was much hotter, tectonic activity was more vigorous than it is today, resulting in a much faster rate of recycling of crustal material. This may have prevented cratonisation and continent formation until the mantle cooled and convection slowed. Others argue that the oceanic lithosphere was too buoyant to subduct, and that the rarity of Archean rocks is a function of erosion by subsequent tectonic events. The question of whether plate tectonic activity existed in the Archean is an active area of modern research. There are two schools of thought concerning the amount of continental crust that was present in the Archean. One school maintains that no large continents existed until late in the Archean: small protocontinents were common, prevented from coalescing into larger units by the high rate of geologic activity. The other school follows that of Richard Armstrong, who argued that the continents grew to their present volume in the first 500 million years of Earth history and have maintained a near-constant ever since: throughout most of Earth history, recycling of continental material crust back to the mantle in subduction or collision zones balances crustal growth. Opinion is also divided about the mechanism of continental crustal growth. Those scientists who doubt that plate tectonics operated in the Archean argue that the felsic protocontinents formed at hotspots rather than subduction zones. Through a process called "sagduction", which refers to partial melting in downward-directed diapirs, a variety of mafic magmas produce intermediate and felsic rocks. Others accept that granite formation in island arcs and convergent margins was part of the plate tectonic process, which has operated since at least the start of the Archean. The general lack of Hadean rocks (older than 3800 Ma) might be explained by the efficiency of the processes that either cycled those rocks back into the mantle or effaced any isotopic record of their antiquity. All rocks in the continental crust are subject to metamorphism, partial melting and tectonic erosion during multiple orogenic events, and the chance of survival at the surface decreases with increasing age. In addition, a period of intense meteorite bombardment at 4.0-3.8 Ga may have pulverized all rocks at the Earth's surface. The similar age of the oldest surviving rocks and the "late heavy bombardment" may not be coincidental. The Archean atmosphere is thought to have nearly lacked free oxygen. Astronomers think that the Sun had about 70–75 percent of the present luminosity, yet temperatures on Earth appear to have been near modern levels after only 500 Ma of Earth's formation (the faint young Sun paradox). The presence of liquid water is evidenced by certain highly deformed gneisses produced by metamorphism of sedimentary protoliths. The moderate temperatures may reflect the presence of greater amounts of greenhouse gases than later in the Earth's history. Alternatively, Earth's albedo may have been lower at the time, due to less land area and cloud cover. By the end of the Archaean c. 2500 Ma (million years ago), plate tectonic activity may have been similar to that of the modern Earth. There are well-preserved sedimentary basins, and evidence of volcanic arcs, intracontinental rifts, continent-continent collisions and widespread globe-spanning orogenic events suggesting the assembly and destruction of one and perhaps several supercontinents. Liquid water was prevalent, and deep oceanic basins are known to have existed attested by the presence of banded iron formations, chert beds, chemical sediments and pillow basalts. Although a few mineral grains are known to be Hadean, the oldest rock formations exposed on the surface of the Earth are Archean or slightly older. Archean rocks are found in Greenland, the Canadian Shield, Montana and Wyoming (exposed parts of the Wyoming Craton), the Baltic Shield, Scotland, India, Brazil, western Australia, and southern Africa. Although the first continents formed during this eon, rock of this age makes up only 7% of the present world's cratons; even allowing for erosion and destruction of past formations, evidence suggests that continental crust equivalent to only 5-40% of the amount formed during the Archean. In contrast to Proterozoic Eon rocks, Archean Eon rocks are often heavily metamorphized deep-water sediments, such as graywackes, mudstones, volcanic sediments, and banded iron formations. Carbonate rocks are rare, indicating that the oceans were more acidic due to dissolved carbon dioxide than during the Proterozoic. Greenstone belts are typical Archean formations, consisting of alternating units of metamorphosed mafic igneous and sedimentary rocks. The metamorphed igneous rocks were derived from volcanic island arcs, while the metamorthed sediments represent deep-sea sediments eroded from the neighboring island arcs and deposited in a forearc basin. Greenstone belts, being both types of metamorphosed rock, represent sutures between the protocontinents. The processes that gave rise to life on Earth are not completely understood, but there is substantial evidence that life came into existence either near the end of the Hadean Eon or early in the Archean Eon. Biogenic carbon has been detected in zircons dated to 4.1 billion years ago, but this evidence is preliminary and needs validation. More solid indirect evidence of life comes from banded iron formations in greenstones that date to 3.7 billion years. The formation of banded iron deposits is thought to require oxygen, and the only known source of molecular oxygen in the Archean Eon was photosynthesis, which implies life. The earliest identifiable fossils consist of stromatolites—accretionary structures formed in shallow water by micro-organisms—dated to 3.5 billion years ago. The Hadean atmosphere was dominated by carbon dioxide and nitrogen (in much the same ratio as in the present day atmospheres of Venus and Mars) but with some NO, CO, P4O10, SO2 and native sulfur. These gases could have accumulated in the atmosphere because volcanic eruptions were between 10 and 100 times more prolific in the Hadean than today Thus, the Hadean Ocean was a reservoir of the inorganic elements that may have been the earliest catalysts of organic reactions and, ultimately, of enzymes. The presence of an ocean, first dating from the late Hadean, would suggest the start of life in the following Archean Eon rather than in the Hadean Eon depended on the presence of an ocean..
Water bodies on dry land, the atmosphere, beaches, sea ice, the sea surface micro-layer, marine sediments, oceanic crusts and hydrothermal systems all contributing to the Hadean micro-environment, would have a drastic impact on the origin of life in the Archaean. The atmosphere has had the most pivotal role since the Miller and Urey experiments in 1953. Their experiments demonstrated the production of biologically important organic compounds (including amino acids) induced by passing electric charge through a mixture of gases which were at the time considered to be the components of Earth’s early, reducing atmosphere (H2O, CH4, H2 and NH3). The Hadean atmosphere could also have hosted particulate matter with catalytic surfaces. On the modern Earth, natural dust particles are largely derived from continental erosion. Dehydration of amino acids during atmospheric transport has been suggested as a mechanism for activation and polymerization. Additionally, amphiphiles (organic molecules with both hydrophilic and lipophilic properties) including stearic and oleic acids have been shown to form exterior films on marine aerosols that could have served as proto-membranes in prebiotic chemistry. Another important role of the modern atmosphere is to protect life in surface environments from solar UV radiation. In the Hadean, the Sun’s output in the extreme UV range was stronger and the Earth lacked a protective ozone layer. Hence, UV radition at the surface was much more intense. It is possible that a hydrocarbon haze might have acted as a UV shield but was transparent to visible light. But in the absence of a UV shield, solar UV radiation could have had both positive and negative impacts on prebiotic chemical reactions in the lower atmosphere and in surface exposed settings, by either activating or destroying prebiotic molecules. Life in the Archaean may have been either very developed as to what we might have expected, or might be a little less so. The production of life has to do with the geological structures present at the time that it was being formed including the relative abundances of each of the elements in the surroundings. This conclusion comes from the Archaean landscape, which at that time consisted of volcanic and tectonic plate activities that formed the greenstone belts found today on the mainland of Greenland. One such example is that of MORB, a primitive Archaean volcanic sediment found in the greenstone belt, which led to the emissions of CO2 and O2 due to the volcanic eruptions at the time. Prerequisites for the origin of life – such as energy, catalysists, the synthesis of organic carbon compounds, and their concentration – can all be seen in both the Late Hadean, as well as Early Archean environments, at different levels and different places on the landscape. This leads to a multi-regional origin of life hypothesis. The microbial life that might have been formed at the time would have been so small that it would have been very easy for it to travel long distances on the Early Earth. These prerequisites allow the Last Universal Common Ancestor of life to have its origin placed in this timeframe. The earliest evidence for life on Earth are graphite of biogenic origin found in 3.7 billion-year-old metasedimentary rocks discovered in Western Greenland and microbial mat fossils found in 3.48 billion-year-old sandstone discovered in Western Australia. Pyrite found in 3.47 billon-year-old barite, in the Warrawoona Group of Western Ausralia, shows sulfur fractionation of as much as 21.1%, because sulfate-reducing bacteria metabolize sulfur-32 more readily than sulfur-34. More recently, in 2015, "remains of biotic life" were found in 4.1 billion-year-old rocks in Western Australia. According to one of the researchers, "If life arose relatively quickly on Earth ... then it could be common in the universe." Fossils of cyanobacterial mats (stromatolites, which were instrumental in creating the free oxygen in the atmosphere ) are found throughout the Archean, becoming especially common late in the eon, while a few probable bacterial fossils are known from chert beds. In addition to the domain Bacteria (once known as Eubacteria), microfossils of the domain Archaea have also been identified. The Archaean Eon fossils might have formed as agglutination bubbles in rock that include but are not limited to stromatolites. Stromatolites are solid structures created by single-celled microbes called cyanobacteria. They are both micro as well as macro examples of life from the Archaean Eon. It is difficult to determine whether a rock may be just that, or a stromatolite. They are found in Zimbabwe, Australia, Canada and South Africa. Earth was very hostile to life before 4.2 – 4.3 Ga, and the conclusion is that before the Archean Eon, life as we know it would have challenged. It can, however, be said that the very beginnings of life could have been taken earlier, while the conditions necessary to sustain it could only have been possible in the Archean Eon. Life was probably present throughout the Archean, but may have been limited to simple single-celled organisms (lacking nuclei), called Prokaryota (formerly known as Monera). There are no known eukaryotic fossils from the earliest Archean, though they might have evolved during the Archean without leaving any. No fossil evidence has been discovered for ultramicroscopic intracellular replicators such as viruses. ↑ Harper, Douglas. "Archaean". Online Etymology Dictionary. 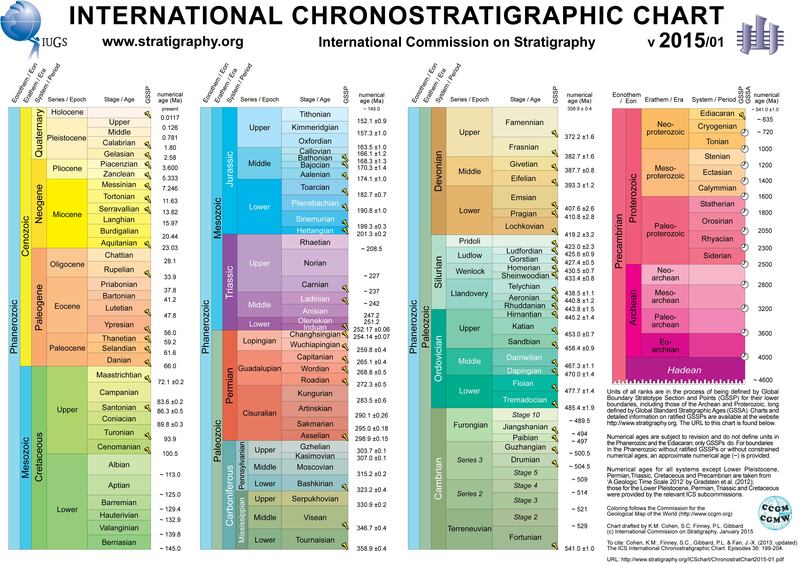 ↑ "International Chronostratigraphic Chart v.2013/01" (PDF). International Commission on Stratigraphy. January 2013. Retrieved April 6, 2013. ↑ Stanley, Steven M. (1999). Earth System History. New York: W.H. Freeman and Company. pp. 297–301. ISBN 0-7167-2882-6. ↑ Walker, James C. G. (June 1985). "Carbon dioxide on the early earth" (PDF). Origins of Life and Evolution of the Biosphere. 16 (2): 117–127. Bibcode:1985OLEB...16..117W. doi:10.1007/BF01809466. Retrieved 2010-01-30. ↑ Pavlov, Alexander A.; Kasting, James F.; Brown, Lisa L.; Rages, Kathy A.; Freedman, Richard (May 2000). "Greenhouse warming by CH4 in the atmosphere of early Earth". Journal of Geophysical Research. 105 (E5): 11981–11990. Bibcode:2000JGR...10511981P. doi:10.1029/1999JE001134. ↑ Rosing, Minik T.; Bird, Dennis K.; Sleep, Norman H.; Bjerrum, Christian J. (April 1, 2010). "No climate paradox under the faint early Sun". Nature. 464 (7289): 744–747. Bibcode:2010Natur.464..744R. doi:10.1038/nature08955. PMID 20360739. ↑ Cooper, John D.; Miller, Richard H.; Patterson, Jacqueline (1986). A Trip Through Time: Principles of Historical Geology. Columbus: Merrill Publishing Company. p. 180. ISBN 0675201403. ↑ Bell EA, Boehnke P, Harrison TM, Mao WL (2015). "Potentially biogenic carbon preserved in a 4.1 billion-year-old zircon". Proc. Natl. Acad. Sci. U.S.A. 112: 14518–21. doi:10.1073/pnas.1517557112. PMC 4664351 . PMID 26483481. ↑ Noffke N, Christian D, Wacey D, Hazen RM (2013). "Microbially induced sedimentary structures recording an ancient ecosystem in the ca. 3.48 billion-year-old Dresser Formation, Pilbara, Western Australia". Astrobiology. 13 (12): 1103–24. doi:10.1089/ast.2013.1030. PMC 3870916 . PMID 24205812. ↑ Martin RS; Mather TA & Pyle DM (2007). "Volcanic emissions and the early Earth atmosphere". Geochimica et Cosmochimica Acta. 71: 3673–3685. Bibcode:2007GeCoA..71.3673M. doi:10.1016/j.gca.2007.04.035. ↑ Miller SL (1953). "A production of amino acids under possible primitive Earth conditions.". Science. 117: 528–529. doi:10.1126/science.117.3046.528. PMID 13056598. ↑ Tervahattu H; Juhanoja J & Kupianinen K (2002). "Identification of an organic coating on marine aerosol particles by TOF-SIMS". Journal of Geophysical Research. 107. doi:10.1029/2001jd001403. ↑ Donaldson DJ; Tervahattu H; Tuck AF & Vaida V (2004). "Organic aerosols and the origin of life: a hypothesis". Origins of Life and Evolution of Biospheres. 34: 57–67. doi:10.1023/b:orig.0000009828.40846.b3. ↑ Polat, Ali (2013). "Geochemical Variations in Archaeon Volcanic Rocks, Southwestern Greenland: Traces of Diverse Tectonic Settings in the Early Earth". Geology. 41: 379–380. doi:10.1130/focus0320131.1. ↑ Stüeken, E. E.; R. E. Anderson; J. S. Bowman; W. J. Brazelton; J. Colangelo-Lillis; A. D. Goldman; et al. (2013). "Did Life Originate from a Global Chemical Reactor?". Geobiology. 11: 101–126. doi:10.1111/gbi.12025. ↑ Yoko Ohtomo; Takeshi Kakegawa; Akizumi Ishida; Toshiro Nagase; Minik T. Rosing (8 December 2013). "Evidence for biogenic graphite in early Archaean Isua metasedimentary rocks". Nature Geoscience. doi:10.1038/ngeo2025. Retrieved 9 Dec 2013. ↑ Noffke, Nora; Christian, Daniel; Wacey, David; Hazen, Robert M. (8 November 2013). "Microbially Induced Sedimentary Structures Recording an Ancient Ecosystem in the ca. 3.48 Billion-Year-Old Dresser Formation, Pilbara, Western Australia". Astrobiology (journal). 13 (12): 1103–24. Bibcode:2013AsBio..13.1103N. doi:10.1089/ast.2013.1030. PMC 3870916 . PMID 24205812. Retrieved 15 November 2013. ↑ Shen, Y.; Buick, R.; Canfield, D. E. (March 2001) "Isotopic evidence for microbial sulfate in the early Archaean era" Nature 410 (6824):77-81. doi:10.1038/35065017 . ↑ R. R. Seal, II (2006), "Sulfur Isotope Geochemistry of Sulfide Minerals", Reviews in Mineralogy and Geochemistry 61 (1):633-677. doi:10.2138/rmg.2006.12 . ↑ Bell, Elizabeth A.; Boehnike, Patrick; Harrison, T. Mark; et al. (19 October 2015). "Potentially biogenic carbon preserved in a 4.1 billion-year-old zircon" (PDF). Proc. Natl. Acad. Sci. U.S.A. Washington, D.C.: National Academy of Sciences. 112: 14518–21. doi:10.1073/pnas.1517557112. ISSN 1091-6490. PMC 4664351 . PMID 26483481. Retrieved 2015-10-20. Early edition, published online before print. ↑ "Early life: Oxygen enters the atmosphere". BBC. Retrieved September 20, 2012. ↑ Garwood, Russell J. (2012). "Patterns In Palaeontology: The first 3 billion years of evolution". Palaeontology Online. 2 (11): 1–14. Retrieved June 25, 2015. ↑ Nisbet, Euan (1980). "Archaeon Stromatolites and the Search for the Earliest Life". Nature. 284: 395–396. doi:10.1038/284395a0.